Few places have the creative energy of Alexandria’s Torpedo Factory. Situated on the riverfront in Old Town Alexandria, the building was, indeed, a manufacturing plant for deadly torpedoes during WWII. Its purpose now, however, is producing explosively exciting art. It’s been converted into three stories of artists studios; visitors are welcome to watch the creative process at work. You run a risk of visual overload if you try to see everything. With 82 studios and 6 galleries, it’s impossible to fully appreciate all the works, even if you spend the entire day. 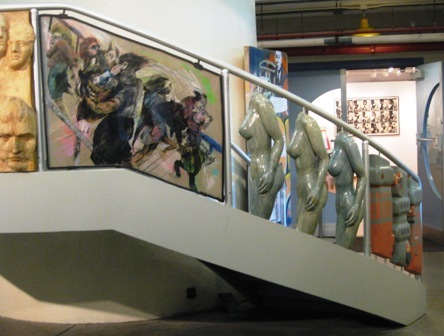 Even the stairwells are works of art, with sculptures creating the railings. It’s far better to casually stroll along the corridors and look in the windows of each studio, stopping at those you find intriguing. 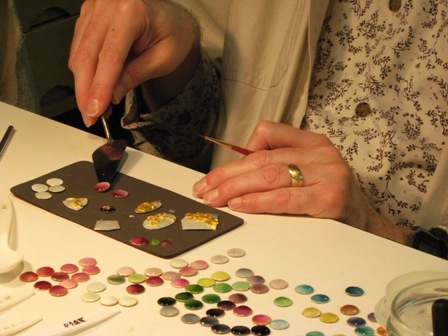 Don’t worry about feeling pressured to buy things; sure, the artists would love to make a sale, but they know most visitors are just looking. They are happy to share their enthusiasm for their medium and their work, figuring that if you really love it, you’ll be back. 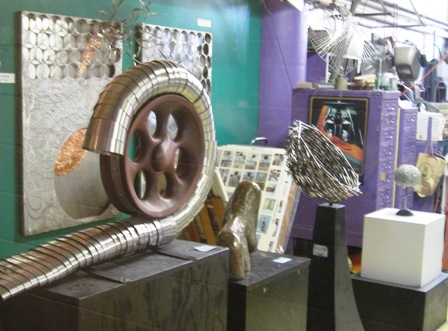 You’re drawn into Chris Erney’s “junkyard” of metal bits he uses for his realistic and abstract sculptures and learn how he started his career as an industrial designer. Ann DiPlacido creates free-form tapestry and large scale weavings. Joan Kasprzak’s ceramics have a very Oriental feel; somehow, you’re not surprised when you learn she is a Master Gardener and a judge for the American Orchid Society. 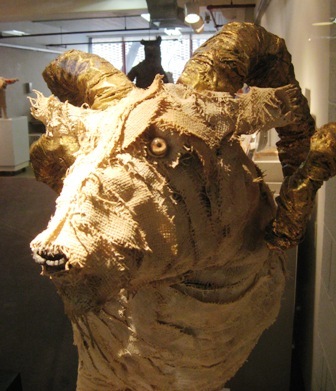 Carol Levin’s textile sculptures of horses and sheep are realistic and nearly life-sized, but her table-sized ceramics address human concerns she dealt with in her first career as a clinical social worker. Phyllis Cohen has great fun with her woodcut prints; her current project is a series of intricate designs incorporating her own, very witty, limericks. Maybe the most fascinating studio is Don Viehman’s. 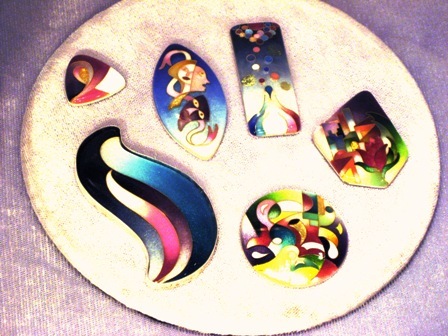 He creates cloisonné jewelry and wall pieces. 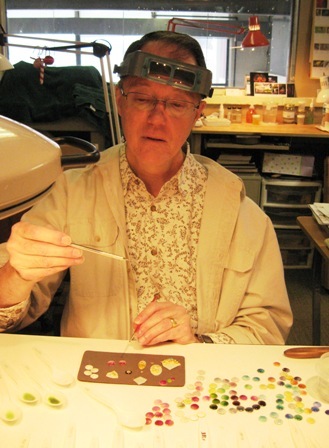 With tiny samples of the colored “dust” arranged before him, he mixes his rainbow and applies the tiniest, most transparent layer onto a space in an intricate design of wire. The result is a piece of luminous hues in a contemporary setting. He may use the same principles of the Faberge Eggs of Russia, but takes it to another level and dimension of sophistication. The third floor of the building has the Alexandria Archaeology Museum. Old Town Alexandria was one of the first historic districts in the country; with so many of the 18th and 19th century properties preserved, it’s a treasure trove for historians. Many of the best “finds” came from long-unused privies. One behind a tavern held dozens of broken clay pipes, snuff containers, and a broken, unusable musket. A soldier’s campground from the Civil War unearthed over 10,000 watermelon seeds and 4,000 cherry pits along with cooking and eating utensils. Amateur historians can purchase a book of the Alexandria Archaeology Trail which includes 40 sites along 23 miles of suitable-for-biking trails.